Bryson City is a small mountain town with friendly folks, gift shops, arts and crafts galleries, antique stores, and a surprising variety of restaurants. Our historic train depot is the home of the Great Smoky Mountains Railroad with plenty of excursions, including a combination train ride / river raft trip that's loads of fun. Throughout the summer and fall there's music every Saturday night at the depot. If you are visiting the Smokies to look at property with thoughts of building a mountain cabin to call your own, you'll find a helpful Chamber of Commerce, well-informed realtors, and home furnishing and decor stores - the complete package for your own retirement or second home dream. North Carolina's half of the Great Smoky Mountains National Park includes Clingmans Dome, Mountain Farm Museum, Cataloochee's Elk Viewing Area, Deep Creek Recreation Area, and miles of hiking and great trout fishing waters. Why not skip the commercialism of Gatlinburg and Pigeon Forge? Come to the North Carolina side of the Smokies and experience all the natural beauty without all the crowds. Our cabins are just a few minutes from the Deep Creek area of the National Park with it's three sparkling waterfalls. And it's just a short drive to Cherokee and the main entrance to the Smokies National Park as well as the southern end of the Blue Ridge Parkway National Park. Cherokee is rich with Native American cultural heritage, including the famous outdoor drama, "Unto These Hills." We'll be happy to help you plan your visit to experience all these Parks have to offer. 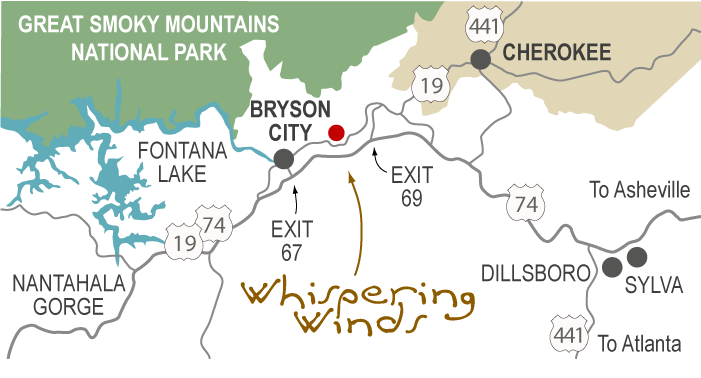 Our cabins are just five minutes from the center of Bryson City in the mountains of Western North Carolina. We're just one hour west of Asheville. Two hours from Knoxville, Chattanooga and Greenville/Spartanburg. And three hours from Atlanta and Charlotte. We're centrally located for all the mountains have to offer. There are outdoor adventures - hiking, mountain biking, whitewater rafting, waterfall walks and trout fishing. And more leisurely activities - scenic drives, shopping, museums, taking a scenic train ride and visiting Harrah's Casino. Come see us!